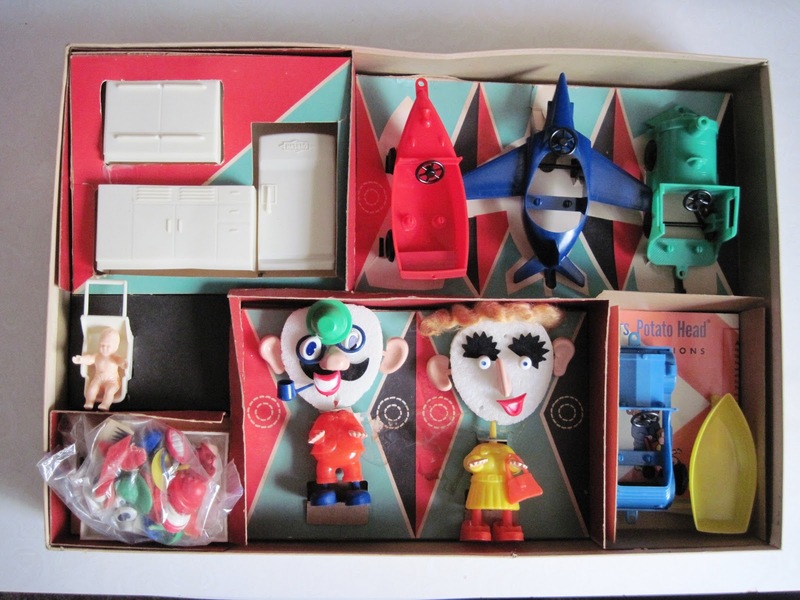 My latest vintage Potato Head set is one of the rarest, and also the largest, with the box measuring in at 18 inches wide by 12.5 tall. 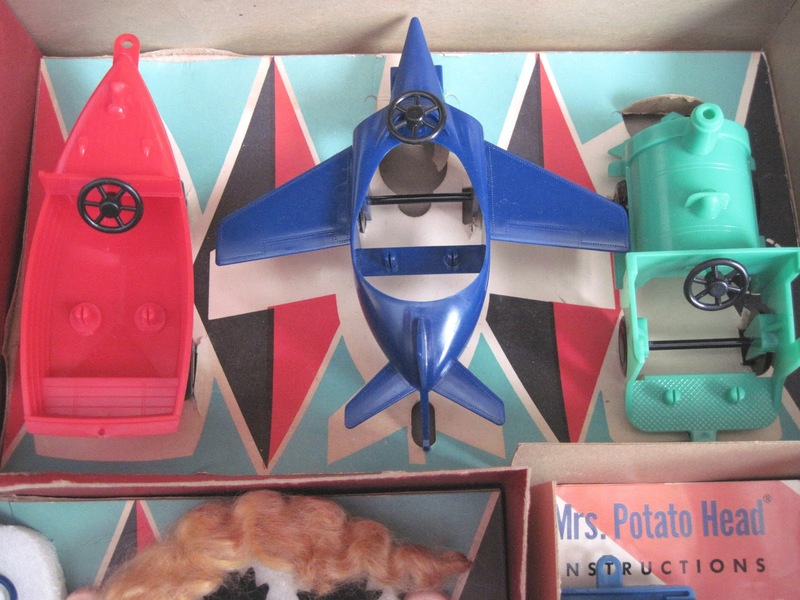 That's a pretty big box for a toy that, in the years before plastic potatoes were added, usually consisted of little more than a handful of tiny face pieces. But the Mr. & Mrs. Potato Head Biggest All-New Combination Pack contains much more than the typical set. In fact, it has everything including the kitchen sink! 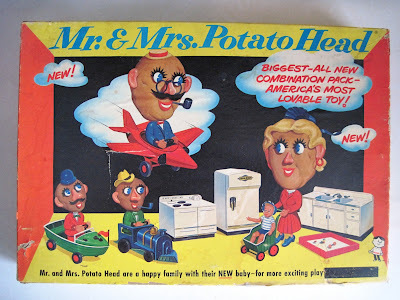 Produced for a brief period in the early 1960s, the Biggest All-New Combination Pack was an attempt to accessorize the Potato Heads in a way that would appeal to both boys and girls, and the large box made it appear to be especially deluxe. 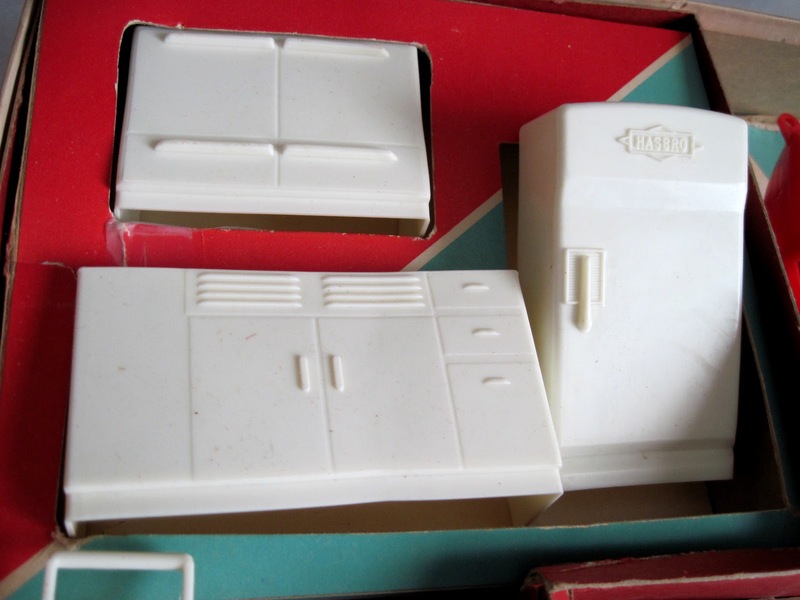 In reality, the set's accessories were cheaper than cheap, but the cover art really sold it. The package included not just one vehicle for Mr. 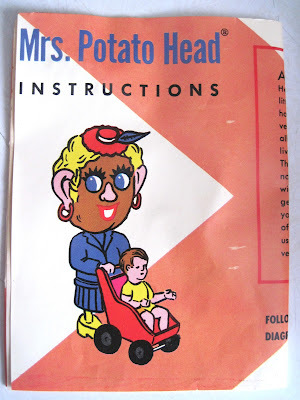 Potato Head, and not just a car, like some of his other sets. This one came with a plane, a train, and a boat. 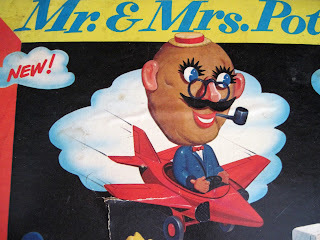 Inside, the accessories were tucked into cardboard backers, while fragile styrofoam display heads held the Mr. & Mrs. face pieces. Both the cardboard backers and the styrofoam heads are very easily damaged while trying to remove the pieces, which is probably one reason the set is so scarce today. Here is Mr. Potato Head's garage. The vehicles are made of a brittle plastic, and the wheels had a tendency to snap off. These are now rarely found intact. This is Mrs. Potato Head's kitchen set. 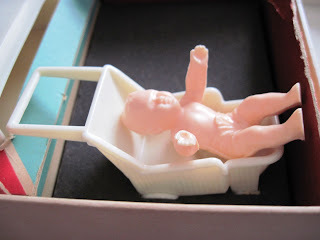 The items are each molded from a single piece of flimsy plastic. They don't have any moving parts, so, for instance, the doors can't open. They are identical to the items found furnishing the metal dollhouses so common in this time period. And here is the much advertised new baby, in his stroller. He must have been adopted, as he is clearly a human baby, and not a potato. 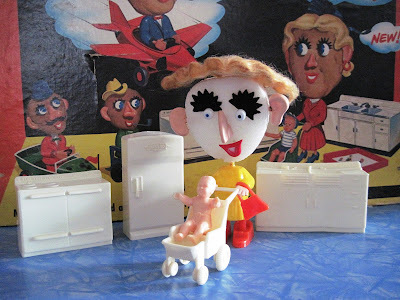 Or perhaps Hasbro didn't want to go to the expense of designing and molding a new potato character, and they just tossed in these cheap dollhouse babies, apparently thinking kids wouldn't notice. Yep, that's right: Mr. 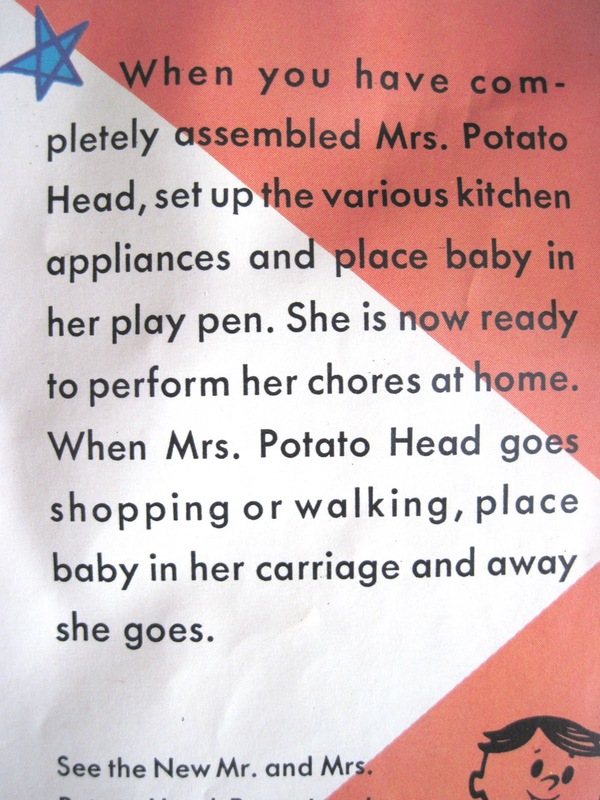 Potato Head gets to go gallivanting about in his boat, train, or airplane, but Mrs. P. is expected to stay home with her non-functioning kitchen appliances and the freaky baby. Thank you for sharing this, it is great! I seem to be developing into a potato as I mature, so I think Aubrey may be right. I wonder if kids were disappointed with he contents of the box. I would by the set just for the box. Very fun! This is priceless! Thank you for posting the photos and adding the commentary. 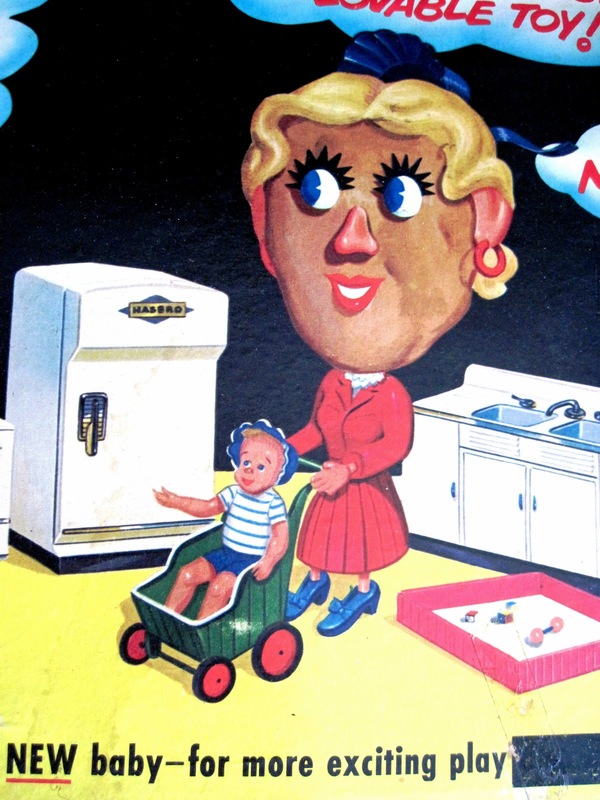 The artwork on the box is kinda creepy, like a human baby was kidnapped by freaky potato-head people! This is great, Tracy. Those flat Styrofoam faces... Where do you find this stuff???! This one is indeed really freaky! And it was a looong time finding. I'm happy to have it finally, but also a bit creeped out having it around. 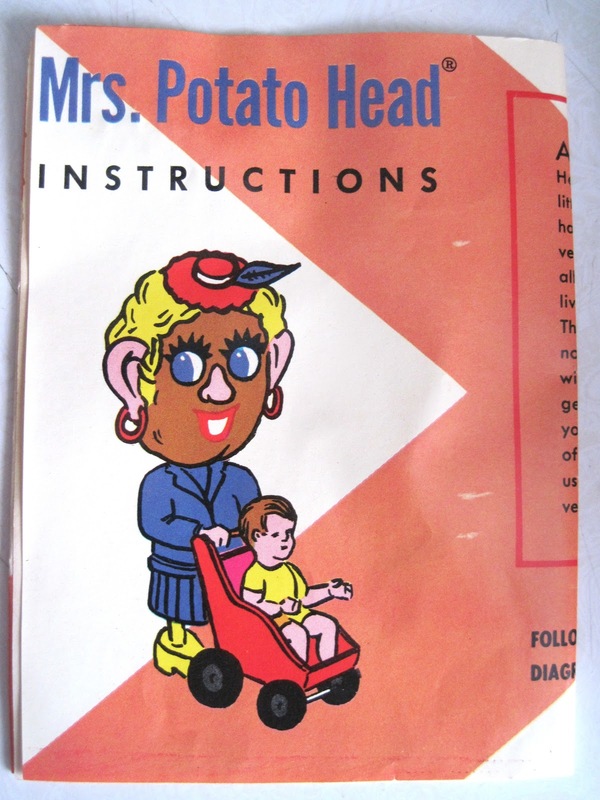 It came from the collection of a big potato head collector who was selling off. I suspect it creeped him out too. that baby is fascinating, how odd!